Check out the Litter Robot, freeing you from the chore of litter box sifting and assuring you a fresh smelling home, the Litter Robot utilizes a patented litter box sifting process that emptys your cats “business” into a large drawer that is capable of holding several days’ worth of waste, leaving you only to grab the bag out of the drawer about once a week, refill the litter, replace the bag, and voila! The company has even designed the Litter Robot to use your everyday biodegradable grocery bags, so while you can buy their Litter Robot bags if you’d like, the bags you already have on hand will work just as well. 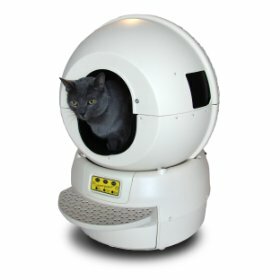 The Litter Robot works with almost any clumping cat litter, and is specially designed to prevent mold growth, thereby controlling or almost eliminating litter box odor. So if you love the kitty, but hate the box, the Litter Robot might change your life (and that of your cat) The litter Robot is durable, good for multiple cats, is about 29″H x 22″W x 24″L18, and weighs under 25 pounds. Get yours today over at amazon.com for 369 bucks. Here kitty kitty….